During week 6 the house guests were told by Julie Chen that they would be competing for a “mystery power” that could be used to “completely change the course of the game,” saying that “It must be kept a secret until the moment it is used.” Throughout the next week the house guests were given various clues to a common big brother phrase. Once a house guest felt they knew the phrase they would go to the diary room and have one chance to guess. After guessing they would not know if they were right or wrong, until the eviction ceremony. At that point they would also be told that the “new power” was the Coup D’etat. Clue 1 – The first clue was a real sheep with a pink bow walking throughout the big brother house. Mike “Boogie” Malin won the Coup D’etat by correctly guessing a Big Brother phrase “You reap what you sow”. Mike was given 3 weeks to use the power before it would expire, however, he chose not to use the power in the first 2 weeks and became the HOH in the third week, so he never used it. During Season 11, the Coup D’etat power was not given to a house guest but rather the American public (America’s Choice) got to vote on who they would like to receive the power. Not surprisingly, America voted for Jeff Schroeder to receive the power. 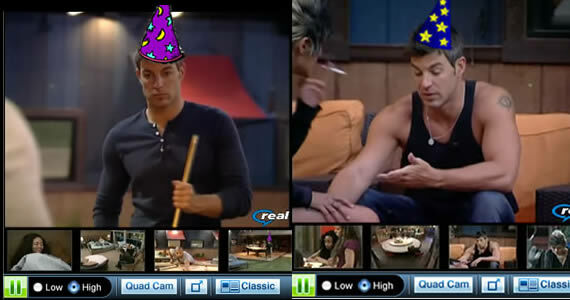 This power was often referred to as the “Wizard Power” by Online Big Brother and big brother fans. Jeff was given two weeks to use the power if he chose to and at the end of the two weeks it would expire. During the first week Jeff chose not to use the Coup D’etat power and Ronnie was evicted on day 33 by a vote of 4-3. The following week Jeff used the power to overthrow Chima’s nominations (Russell & Lydia). As Chima was the HOH and Kevin was the Power of Veto holder they were immune from being nominated. Jeff nominated Natalie and Jessie for eviction . Neither Jeff nor Chima were allowed to vote and as a result Jessie was evicted on day 40 by a vote of 3-2. Due to the Coup D’etat power being used all of the house guests were able to compete to win the next HOH competition.